Welcome to my custom rod page! Here you'll find photos of my rod works and more. My handcrafted fly rods are beautifully fitted fly fishing rods from the finest graphite and fiberglass blanks available in the rod building industry. I put my time and knowledge in creating masterpiece rod works for the most discriminating fly fishermen. Every finished rod is a "one-of-a-kind", heirloom quality fly rod and a perfect fishing instrument. 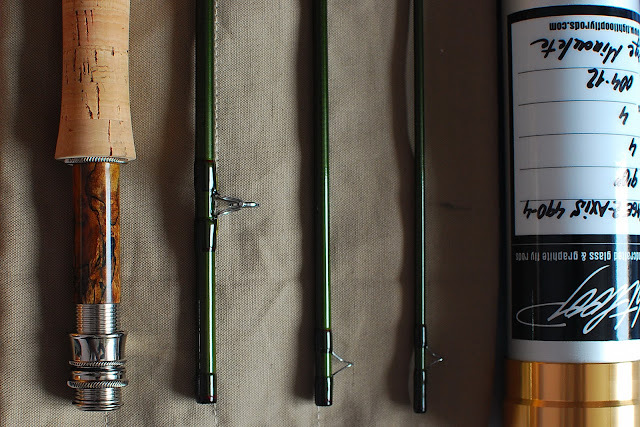 I use only the best materials available (blanks, guides, reel seats, cork and silk thread) for my rods. 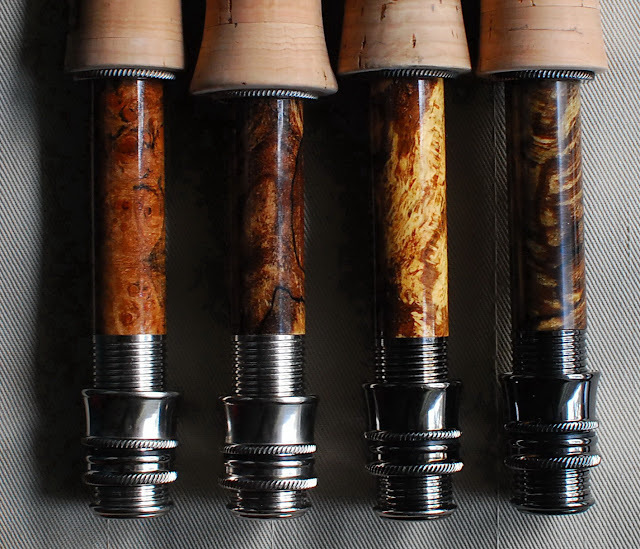 The best blanks from the major rod/blank manufacturers like Sage, Winston or Orvis or small but fine blank manufacturers like Dan Craft (Five Rivers Rod Blanks) are carefully selected for my rods. Dan Craft blanks have been my long time favorites. I have found that they cast and fish very pleasurable, having all the great qualities a fine graphite rod should have and at a great price. Mark Steffen at Steffen Brothers Fly Rods, Yasuyuky Kabuto (Kabuto Rods) and Mike McFarland have set new standards in fiberglass rods. 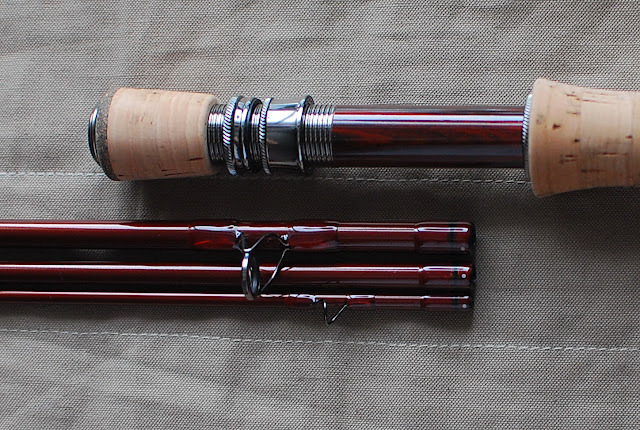 These modern fiberglass rods are aesthetically beautiful, functionable fly fishing tools. The new Epic S2 fiberglass blank concepts by Carl McNeill are the ultimate in glass offerings. Nonetheless, the latest Tom Morgan fiberglass blanks are defying perfection and are the classiest. These very special blanks are reministent of the old Winston Stalker fiberglass rods but they are better quality and more refined fishing tools. Lemke Concepts reel seats (made by Joel Lemke, former Struble designer and machinist) are to be found in many of my rod works. Joel Lemke had 28 years with Struble before being laid off in 2008. He didn't want to move north to Portland after the new owner bought the company. He had 13 years with Glenn Struble, his mentor. When Glenn passed away in 1993, Joel took over as designer and head of production. He received a lot of input from great designers like Don Green, Jerry Siem, Larry Kenney, Kerry Burkheimer and the great Tom Morgan. While at Struble, Joel decided if he will ever get out on his own, he would do things a little different. Having his hands on different types of parts, it opened his eyes to different ideas. His innovative reel seat designs are not only functionable but also beautiful to the eye. From stainless steel, titanium, steel, bronze and aluminum are just a few of the materials used in production for the other industries that Joel works with. These reel seats are some the finest in the industry. The threaded barrel up/downlocking reels seats are available in .595", .640'' and .705'' o.d. with a variety beautiful wood inserts to choose from. They are made of high grade aluminum and come in nickel silver plating, dark nickel silver, black anodized or bronze. There are also two all metal version of these seats available in .640" o.d. and .705". Nickel silver, dark nickel silver plating and black anodizing. With Struble Company closure, I find myself looking at Lemke reel seats more and I expect more beautiful designed seats to come out of Joel's shop in the future. Joel kindly accepted to machine two exclusive downsliding reel seats for my custom fiberglass rods after my ideas. These seats feature .705" o.d. and exquisite woods. They are available in nickel silver plating, dark nickel or black anodized. Bronze anodized can be done as well on request. Flared and radiused end caps hardware design with complementary sliding rings and finishing rings. Below, you'll find photos of my rod works. If you find them to suit your taste don't hesitate to contact me to build you a custom rod. The modern fiberglass (unidirectional glass) rods have become highly popular again these days. 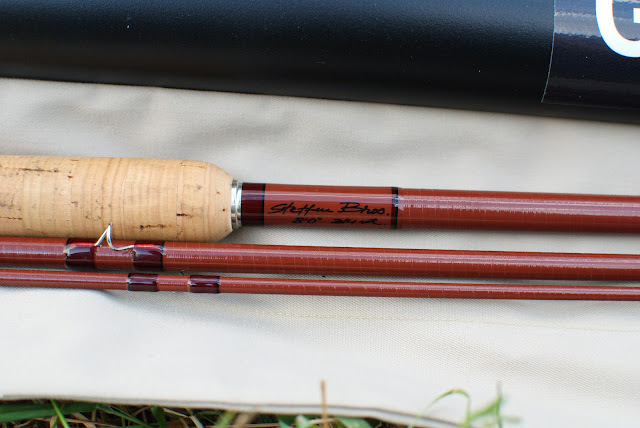 Fiberglass fly rods are ideal for delicate presentations in difficult trout and grayling waters, in any small to medium sized river and even big rivers. Roll casting with these is easy and fun. I fish a lot and these glass rods changed my creek trout fishing into more fun. 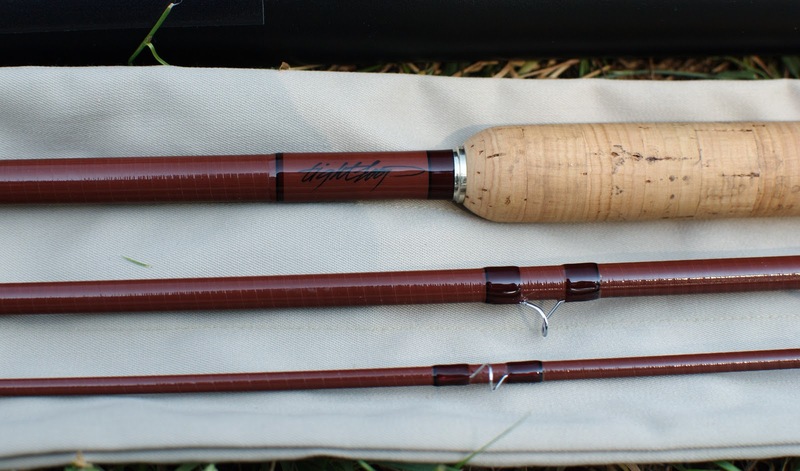 No other material used in a fly rod can match the flexibility and feel of a fiberglass fly rod. Steffen Brothers, Kabuto and McFarland rods are a prime examples. Recently, the legendary Tom Morgan of Tom Morgan Rodsmiths has finally released his stunning, long expected fiberglass blanks. Rolled by Kerry Burkheimer, these beautiful rich reddish brown colored blanks are close to perfection. The blanks are very hard to obtain, but they are worth the wait. With medium-slow to medium and sometimes medium-fast, progressive actions they offer unmatched line feel throughout the cast. Most blanks are beautifully spiral finished and rods are fitted for a classic look. They are thinner walled and fairly light in the hand, unlike their predecessors. If you want to slow down the rhythm and cast a smooth line on your favorite trout creek, mid-sized or even a bigger river, just like in the good old days, go ahead and experience a modern fiberglass rod. The lighter weights ranging from 6'0''-8'0'', and 1/2 wt. to 3/4wt. are ideal for trout fishing in small streams. 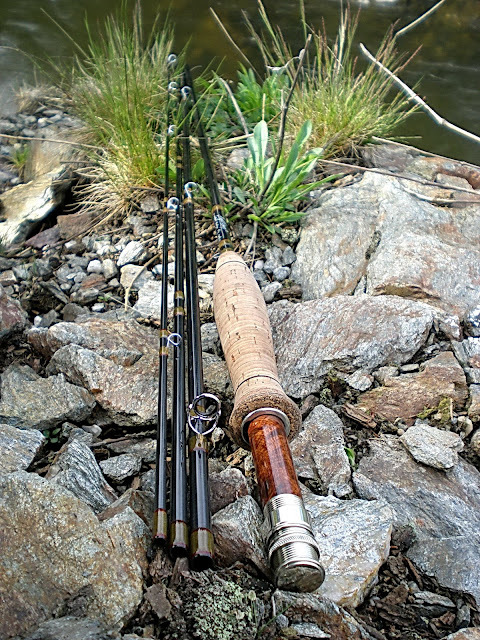 Longer and heavier rods, from 8'0'' to 8'6'' and 4/5-6/7wt. are smooth and powerful rods for mid-sized and large rivers. They even go as far as 7/8wt. and 8/9 wt. for bass, pike and carp fishing. Thank you for looking and your interest in my work!